Posted on Fri, Nov 2, 2012 : 2:53 p.m. The news that the Winter Classic won't be coming to Ann Arbor on New Year's Day due to the NHL lockout has local officials and business owners disappointed. "We're obviously very disappointed," said Michael Harman, general manager of the Dahlmann Campus Inn in downtown Ann Arbor. Harman said his hotel wasn't quite fully booked up yet, but he had every anticipation that it would be full. Now he plans on refunding any deposits the Campus Inn had received. "We were looking forward to welcoming the many fans of NHL hockey to Ann Arbor and particularly to the Campus Inn, but other than that I just think it's disappointing that a lockout would interfere with so many fans' enjoyment," he said. 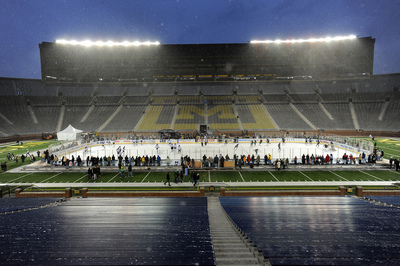 The Big House may not see a hockey rink on the field this winter. It would mean no $3 million payday for the university, and could hurt area hotels. The NHL locked out its players six weeks ago after the two sides could not reach a new collective bargaining agreement. The NHL officially announced the cancellation of the Winter Classic on Friday on its website. Read the announcement here. The game would have featured the Detroit Red Wings taking on the Toronto Maple Leafs at Michigan Stadium on Jan. 1. Mary Kerr, president of the Ann Arbor Area Convention and Visitors Bureau, said the CVB has been estimating anywhere between 3,000 and 6,000 room nights would have been booked at area hotels for the event, a major boost during a particularly slow time of year in Ann Arbor. She estimated the Winter Classic would have had about an overall $15 million impact on the local economy, and she's hoping that can still happen on Jan. 1, 2014. "Everyone's really disappointed, but this gives us more lead time to put together a really magnificent event for next year," she said. Kerr said no decision has been made yet whether a New Year's Eve block party where a portion of Main Street would be closed down the night before the Winter Classic would go forward. Mayor John Hieftje said he's sure some hotels and restaurants that were counting on extra business from the Jan. 1 hockey game at Michigan Stadium aren't happy. But the Winter Classic isn't an event the city has hosted before, so in that regard he doesn't consider it a huge loss for Ann Arbor. "I think it was going to be a good event for the city," he added. "Because for one reason, that's a quiet day in the city and I don't think it would have taken much in the way of policing resources. The students would not have been in town and it may have been easier to handle." Hieftje said he knows many of the local hotels were being booked up, but he said they're often full for New Year's Eve anyway and it would have been just one extra day of business in most cases. The year's Winter Classic and the companion SiriusXM Hockeytown Winter Festival called for the construction of major outdoor ice rinks at both Comerica Park and the Big House. Multiple games involving teams from the NHL, NCAA, American Hockey League, Ontario Hockey League, high school and local minor hockey leagues were scheduled, requiring travel and hotel commitments. Beyond the construction of two outdoor rinks, the combined events were preparing to welcome nearly 400,000 guests to Detroit and Ann Arbor over the holiday period. Spinoff revenue from previous Winter Classics in Boston, Pittsburgh and Philadelphia have been reported to be between $22 million and $36 million. Many downtown Ann Arbor restaurant owners said they were disappointed by the news of the event's cancellation. Some said they would have opened specially for the Winter Classic visitors on New Year's Day — a time when the dining-out crowd is typically slower. "It's a huge income loss for (Ann Arbor)," said Maggie Long, general manager and executive chef for the Jolly Pumpkin at 311 S. Main St. "It's unfortunate that we lost the exposure to new people." Long said the loss of the Winter Classic was more of a loss for Detroit than Ann Arbor. She said she's been doing some research into the impacts of the NHL game in Boston and speculated on the effects of bringing in a new crowd of people from Canada to experience Detroit. "It's a sad thing for the town," she said. Jon Tipton, manager of The Ravens Club at 207 S. Main St., said the Winter Classic would have been like having an extra home football game in the middle of the winter — events that have tremendous positive impacts on his business' bottom line. However, Tipton said the loss of the NHL event wouldn't be completely devastating, as The Ravens Club typically does well during the Restaurant Week that happens each January. Binod Dhakal, manager of Shalimar at 307 S. Main St., said the loss of potential new customers to his business and the exposure of the downtown district to visitors was sad. "We were hoping to have good business that day," Dhakal said, noting Shalimar is typically closed on New Year's Day. Though Dhakal said Shalimar didn't have any big plans for the day, he said there was nothing that could be done about the NHL’s decision and that the business would have to wait until 2014. AnnArbor.com reporter Amy Biolchini contributed to this report. Sun, Nov 4, 2012 : 5:29 p.m. I know what they will do. Build more art? There is always a bake sale. Not. Sat, Nov 3, 2012 : 6:44 p.m. The NHL is a JOKE! Bettman needs to be done with the ruining the NHL. Sat, Nov 3, 2012 : 3:25 p.m. This is so pathetic on so many levels. The NHL strike, the lock out, the owners and the players. Who really suffers? The fans. Sat, Nov 3, 2012 : 2:24 p.m. It was money that could have been made and was not, a future that did not come to pass. Why the fuss? Sat, Nov 3, 2012 : 10:41 a.m.
that's what happens when billionaires fight it out with millionaires for the almighty dollar and looney... the small people all get screwed. i still think they should hold it on the frozen part of Barton pond when it gets down to -16ºF.. let's see who loves hockey and not money then... lace 'em up Gordie, you're goin' in! Sat, Nov 3, 2012 : 2:17 a.m.
Keep in mind, everyone, it's looking pretty likely right now that Michigan Stadium will host the Winter Classic next time around in 2014, instead of 2013. This would have been a one-time shot in the arm for the economy here if it happened this coming New Year's Day. If it happens a year later, we'll still get that same shot in the arm, just a year later. Sat, Nov 3, 2012 : 6:43 p.m. Sat, Nov 3, 2012 : 2:20 p.m. Sat, Nov 3, 2012 : 2:12 p.m. Thanks Ryan. I was going to comment as much earlier but I figured it was so obvious. There is not a stadium in the WORLD with a location that can compete for a one-day event.. Those much maligned billionaires know how to make a buck and they are not going to pass up the opportunity. If it goes well it may end up happening more than once. If you consider Ann Arbor is a five hour drive from two of the largest population centers in North America (Toronto &amp; Chicago) then you realize that there is some serious potential for an annual or a biennial event. Sat, Nov 3, 2012 : 2:02 a.m. Given that there are few events at Michigan Stadium that bring in a large amount of revenue, it may have been a bit short sighted of the mayor to say it would have just been one lost day of business...WAIT, what am I saying. If I'm going to lose a day of business, I want it to be July 30th. We live for football Saturdays! There are only six this year and having the Winter Classic? It was going to make a big difference. Fri, Nov 2, 2012 : 11:22 p.m. Sat, Nov 3, 2012 : 7:13 a.m. Sat, Nov 3, 2012 : 6:55 a.m. SOME businesses may have been helped, others could be hurt, but dont let facts get int he way of your argument. This is typicla of the stupidity of the anti-mayor crowd. Tell me what exactly the MAYOR could have done to make this work? maybe this is an example of businesses not counting their chickens until they are hatched. Fri, Nov 2, 2012 : 10:23 p.m.
Fri, Nov 2, 2012 : 9:53 p.m.
Our feckless leader, King John I, doesn't feel this is a real loss? Sweet. Maybe he'd like to tell that to business owners and staff that would've made $$ to make e.g., mortgages, rent, car payments, daycare bills? Vote him out. Anyone, even my dog Bernie, is better. Sat, Nov 3, 2012 : 9 a.m. Sat, Nov 3, 2012 : 6:53 a.m. If those people are COUNTING on money that is a once in a lifetime event, they are poor planners. If this never happened before how is i a loss? IF it happened it is actually a gain, if it doesnt, it is a break even. That is basic math. I also think it is wrong to think it helps all businesses. Art Fair s a prime example of many businesses that get hurt because of it. SO are home football games. Try having a hair salon, in the areas where there is huge traffic. Your regualr business goes away for those times. Fri, Nov 2, 2012 : 8:36 p.m.
Fri, Nov 2, 2012 : 9:11 p.m. Being philosophical about someone else's lost income is easy. Fri, Nov 2, 2012 : 8:49 p.m. If it isn't such a hit to lose it, then why were we having it in the first place? Fri, Nov 2, 2012 : 7:54 p.m. Sat, Nov 3, 2012 : 6:41 p.m. It is not the university Hondo, it is the local hotels, restaurants and other various businesses that will miss out on another big day of spending. Fri, Nov 2, 2012 : 7:48 p.m.
Maybe Michigan can get around and come up with a College team tournament. like getting MSU and Northern and whoever else would be an attraction, to have their own tourney instead of the loser pro's..... Seems there will be time to make the arrangements, and perhaps the hotels won't have to lose their customers?????? GET BUSY NOW AND FIGURE IT OUT..........!!!!!!!!!!!! Sat, Nov 3, 2012 : 2:23 p.m.
Fri, Nov 2, 2012 : 11:52 p.m. Apparently you have never heard of the Great Lakes Invitational. Fri, Nov 2, 2012 : 7:21 p.m.
AA pandering to the the lowest common denominator... priceless!